We spent three or so days in Boston and thoroughly enjoyed ourselves. I have some thoughts, which likely won’t surprise you. 1)	I’m a bit of a history buff, so it was really really cool to see all the historical sites. We walked the Freedom Trail first thing when we got there. This is a trail that starts in Boston Common (est. 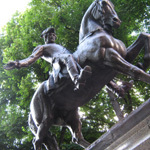 1634) and continues past places like Old North Church, Paul Revere’s House and Faneuil Hall. There is actually a red line on the street (or red brick) that you can follow the length of the trail. Easy as pie! We didn’t quite make it all the way to Bunker Hill, but we almost did. 2)	There are dead people everywhere. If you’ve known me more than two seconds, you know that I cannot resist a cemetery. Well, in Boston, you can’t avoid them. Seriously, we were passing a burial ground every ten feet. I was completely captivated by Paul Revere’s grave and I did tell Samuel Adams that he has good beer. For real. I think he heard me. 3)	The waterfront lifestyle is interesting to me. There is some of that in New York, but I’ve never seen anything like all the sailboats in Boston Harbor. I don’t know how to sail. I don’t know if I’d like sailing. But I definitely liked seeing all the boats sparkling in the sun. We took a long harbor cruise and the tour guide says if you live in Boston you can learn to sail for free. That’s pretty cool. There are lots of islands around Boston, each with its own unique history. We enjoyed learning all about them. If you had a week, you could probably visit each one, at least briefly. I didn’t really see any beach-y areas, but I’m sure there are some. We also enjoyed eating fresh seafood and visiting the aquarium. Those kinds of activities are always a bonus of being so near the water. 4)	We visited five neighborhoods: Back Bay, North End, South End, Charlestown and Beacon Hill. We also spent some time in Chinatown. The neighborhoods aren’t quite as distinct as in New York, but I could definitely tell when we moved from one to the other. The North End was quite captivating, with all the Italian restaurants and interesting nooks and crannies. Next time we visit, I’d like to move out away from downtown and visit some others. We did not go to Cambridge/Harvard, so don’t ask. I just didn’t care to and I guess Mike didn’t either, because he didn’t mention it. 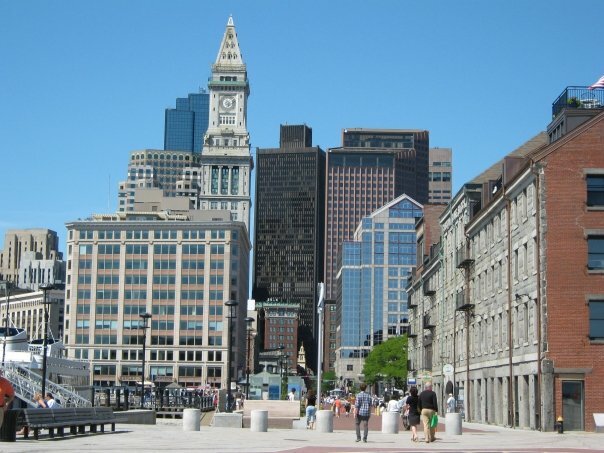 5)	Boston’s population is about 609,000 (metro 4.5 million), so it’s not huge, but it’s certainly a decent-sized city. For its size, it is unbelievably clean. I’m not kidding. It made me nervous, like no one lived there. Even in the tourist areas—and admittedly, we were in very tourist-y areas—there was no trash around. Anywhere. I’d like to know how that’s possible. 6)	Also if you’ve known me for two seconds, you know my love of subways and public trans. I was anxious to try out Boston’s T, which I’m now referring to as the “Fisher Price Subway System.” When they say orange line, they really mean orange line. Everything is orange. Likewise for blue and whatever color line you are riding on. Our tour guide says the T is the nation’s first subway system, so props to Boston for that. The cars are smaller than New York’s, but likely about the same as Chicago’s. Also, the trains are pretty short and they don’t necessarily fill up the whole platform, so one time we had to run to get on the train even though it appeared we were in an okay spot. The trains were efficient, though, and the maps super easy to read. All together, Boston was a great time and I’m glad to have visited and I’d like to go back. I recommend it. I’m glad to mark Boston off my list of “Cities I Want to Visit.” Next up will probably be Philadelphia or Washington, DC.